Pet Express Animal Hospital is dedicated to optimizing patient outcomes. 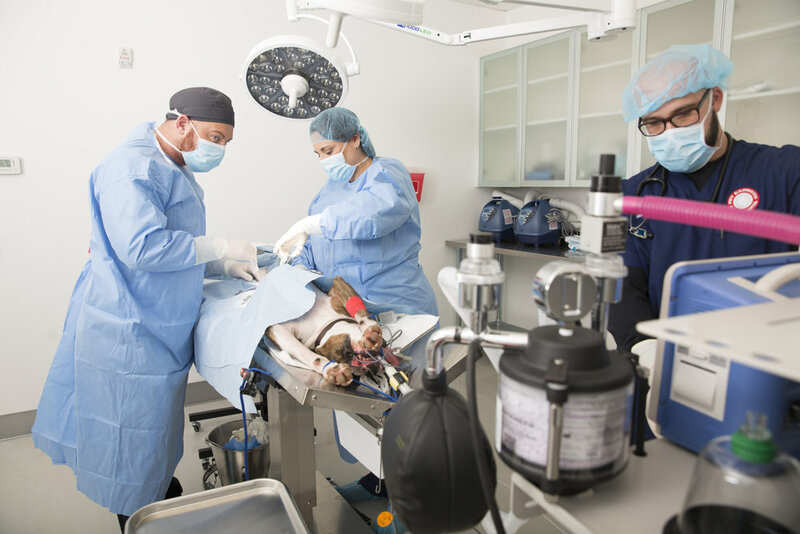 We have assembled a surgical team that works collaboratively across all specialties to provide the best possible care for your pet. Our veterinarians and surgeons work together to determine the least invasive and most effective procedures — whether it’s a routine spay or neuter, or a more complicated surgery to treat arthritis, hip dysplasia, lameness, paralysis, or other debilitating condition. Our veterinarians perform a variety of minimally invasive techniques whenever possible to promote rapid diagnosis, repair, healing and to minimize patient discomfort. Please do not give food or water for at least 12 hours before, or the night before surgery. This is due to lack of muscle and bowel control while pets and animals are under anesthesia. Keep your pet calm & quiet after operations, any excessive movement can compromise the healing process through rips or tears. Do not bathe your pet, nor remove it's e-collar until revisit and sutures are removed. Minimally invasive surgeries are performed through small incisions instead of one large opening. Due to this process patients tend to have quicker recovery times and less discomfort than with conventional surgery — all with the same benefits. Laparoscopic surgery is a modern surgical technique in which operations are done through very small incisions which is the best way to achieve minimally invasive surgeries. An endoscope is a thin flexible tube with an attached camera that allows your veterinarian to see. A doctor inserts an endoscope through a small cut, or an opening in the body such as the mouth. Which then allows the doctor to use forceps (tongs) and scissors on the endoscope to operate, remove forign bodies, or remove tissue for biopsy. Arthroscopy: a surgical procedure used to visualize, diagnose, and treat joint disease. Intraoperative fluoroscopy: a continuous x-ray transmitted to a monitor to enable the treatment area and its motion to be seen in detail (often used for fracture repair). Thoracoscopy: internal examination or biopsy within the chest cavity, to help identify and treat certain heart/lung diseases. Stent placement for collapsed trachea: treatment for a common cause of cough in dogs due to decreased strength within the cartilage of the airway or “windpipe”. 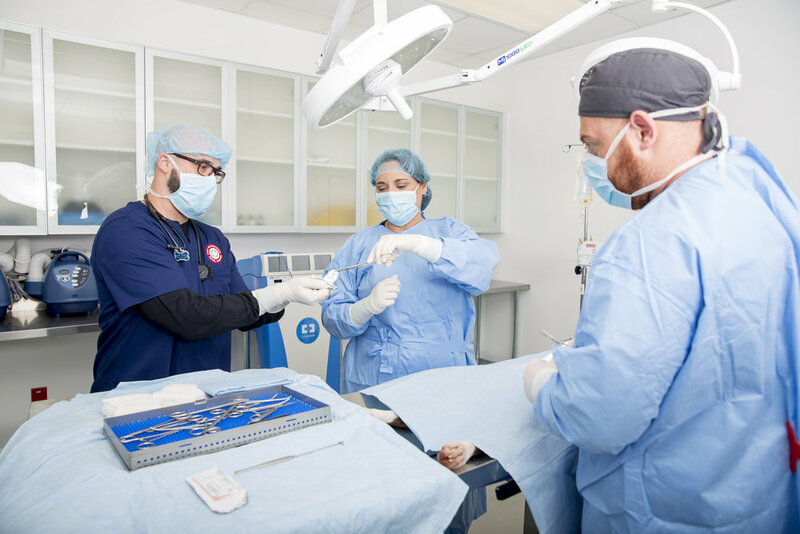 Our orthopedic veterinary surgeons treat congenital and acquired injuries of bones, joints and the spine using the newest bone plating, pinning and fixation devices and methodologies. Orthopedic trauma is managed by procedures designed to stabilize fractures, treat soft tissue injuries and promote rapid recovery. A variety of minimally invasive techniques are used where possible to promote rapid diagnosis and repair. These techniques include: percutaneous plating and fracture stabilization, which is made possible with intraoperative radiology, and arthroscopic evaluation and treatment of joint (shoulder, elbow, and knee) problems. Veterinary surgeons performing soft tissue procedures also work closely with specialists in internal medicine, oncology, diagnostic imaging, and critical care to diagnose and treat certain diseases that involve the chest, abdomen, skin and other soft tissues. This team approach provides a wide range of medical and surgical expertise and helps to ensure that your pet receives the best possible options for an optimal outcome. 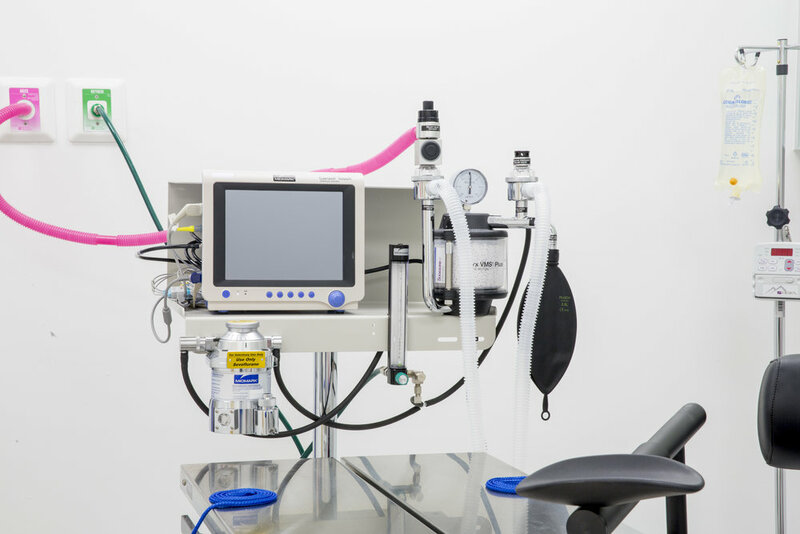 Additionally, minimally invasive procedures are performed when possible to promote healing while minimizing patient discomfort. Such techniques include biopsies as well as reparative procedures for certain diseases that involve the chest or abdomen. Pet Express Animal Hospital is unique to offer multiple frequency laser treatment therapy sessions for animals. Laser treatment is the latest in post- surgery therapies by using a unique process in which a low-heat laser is passed above the treated area, stimulating blood cells which in turn accelerate the healing process. With just a few sessions, laser therapy is great for: trauma scars, treatments, low heat arthritis, knee cap damage, dental wound inflammation reduction, and bleeding.